My life is broken into two halves. They’re not equal halves, but sometimes they feel that way. The first half is spent trying to figure out how reality works, if time is real, and what it means to be alive; the other half is spent scheduling my life around sporting events I am compelled to watch, even though I don’t care who wins and won’t remember anything significant about the game in two weeks’ time. It makes no sense: All winter long, I’m constantly trying to catch random mid-major college basketball games between second-tier teams going nowhere, all while realizing I can’t remember who played in the Final Four just three years ago. It’s a (very minor) paradox. But a less minor paradox is why the achievement of my second goal is so consistently unsatisfying, even though technology has made it remarkably simple. This phenomenon is inescapable (I’m sure some might disagree, but not any sports fan I’ve ever met). It’s going to be the principal issue TV audiences have with coverage of the Summer Olympics since live events in London will almost never match up with the prime-time window when NBC will want to show them. For most North Americans with normal jobs, the 2012 Olympics will not be experienced as living history; they will be experienced as recent history. And that will create the same intangible loss. It doesn’t matter how much I sequester myself or how thrilling the event is — if I know the game has finished, it’s difficult to sustain authentic interest in what I’ve recorded. I inevitably fast-forward to the last two or three minutes (even when I have no vested interest in the outcome). Since I’m watching the game purely for entertainment, it shouldn’t be any different from the real thing. It should, in fact, be better, just as it’s more enjoyable to watch self-recorded episodes of Frontline or Storage Wars or any other traditional show that lives inside my DVR. In theory, I should be able to enjoy every single game I want to see, on my own schedule — all I need to do is avoid the Internet for a few hours and not glance at the ESPN ticker on public TV screens. But it never works: I get home, I start watching the recent past, and I find myself rushing toward the present. I believe there are five reasons this happens. I’ve broken them down into two categories — the rational explanations (which play a minor role) and the irrational explanations (which matter way more). 1. The removal of commercials erodes drama: If I record a sporting event, there’s no way I’m sitting through the commercials. That would be like volunteering for a DUI. One of the central pleasures of self-recorded TV is eliminating our forced exposure to advertising. Yet this is probably an error, at least when consuming sports. It’s during those moments when nothing is happening that the drama of a game becomes most palpable; this is why static sports like baseball and golf generally feel more gut-wrenching than fluid sports like soccer and hockey. By purposefully skipping all the game breaks, I’m inadvertently skipping the gaps that manufacture tension. I should probably just sit through every commercial and let the tension build. But I’ll never do that, because that would make me an idiot. 2. By watching a game after the fact, I am consciously distancing myself from the actual experience: Do you remember the controversy following Ricky Gervais’ hosting of the Golden Globe Awards? In all likelihood, it’s the only thing you remember about the Golden Globes, if you remember them at all: Gervais made a handful of funny, mean-spirited jokes about The Tourist and Charlie Sheen and Scientologists, and it probably changed the trajectory of his entire career. But here’s the twist — the reaction to those jokes varied wildly, depending on how and when you saw them. If you watched those clips on the Internet a day later, they didn’t seem remotely problematic (if anything, they came across as a bit obvious). But people watching the show live on TV were more polarized, and people who attended the event in person were actively disturbed (even if they weren’t necessarily targeted or offended). This, I suppose, is a nonstoned way to describe the (completely unscientific) concept of “levels of reality.” The celebrities and media members in the same room with Gervais were experiencing a “hard reality” — they were sharing the same space in real time, and they were tangibly connected to what was happening. If someone in the room was humiliated, they could feel that humiliation; they could look over at Robert Downey Jr. and watch him pretend not to care. For people watching live on television, it was a “soft reality” — they were sharing time, but they weren’t sharing space. TV audiences were surprised by what Gervais was saying, but it still looked and felt like television (the participants seemed less like actual people and more like actors playing themselves). For those of us who watched those same clips 24 hours later, there was pretty much no emotive response whatsoever; if you liked (or didn’t like) the jokes, it was for personal or aesthetic reasons. The entire affair was now a construction (i.e., the softest reality possible). The same thing happens with sports. If you watch a game in person, you’re forced to connect with it emotionally (even if you don’t want to be there). If you watch it live on television, the network airing the game tries to compensate for your physical distance by maximizing the pertinent details — they shoot the game from the best possible vantage point, they show replays from different perspectives, and they hire announcers to contextualize what you’re already seeing. But here’s what the networks can’t do: They can’t make you forget what time it is. They can’t trick you into believing that this game is still happening. They can’t make you forget that the outcome of the game has been established and that what you’re now seeing has been scripted by the rotation of the earth. You know this, and you can’t unlearn it. 3. Recording gives me too much control: This seems backwards, but it’s probably common sense. The most reassuring thing about television is that it’s a passive experience — it’s one-way entertainment. You sit motionless and watch what’s happening, and it’s totally acceptable to surrender your agency. But if you’re watching a game that’s already happened, you’re constantly forced to decide whether or not it’s worth the investment of your time. You suddenly have too much agency. You know you could just walk over to your computer and learn everything important in seconds (i.e., who won, what the highlights were, what the takeaway is), so the play-by-play action needs to be more entertaining than every other life option you have at that moment. As soon as one team takes command, it feels wasteful to wait and see if the trailing opponent makes a comeback. When I watch a bad football game live, I tend to unconsciously place the blame on the players and coaches; this is a misguided and childish reaction, but it’s a natural reaction. However, if I watch a bad football game three hours after it has finished, I can only blame myself. g. People who refuse to accept that even “live” TV events are on a seven-second delay. Now, is this compulsion bad? I suppose it isn’t. It’s egocentric and baseless, but it increases the degree to which people enjoy sporting events (and since sports are ultimately entertainment, this is good for everyone involved). Yet this perverse, illogical dream is killed by the prerecorded event: If you think your mind and heart play a role in the game you’re watching, a DVR’d game is like trying to hug a dead body. Your hopes and desires immediately become irrelevant. Which, of course, they always were — but now you can’t even pretend. 2. “If this game has already ended and I don’t know anything about what happened, it was probably just a game”: This sentence is so obvious that it’s almost nonsensical, but I suspect it’s the one point that matters most. It’s the central premise behind the entire concept of “liveness,” which is what this whole problem comes down to. A little more than five years ago, Kobe Bryant scored 81 points against the Toronto Raptors. That game wasn’t on TV (it might have been on NBA TV, but I didn’t have that network at the time). I had no chance to watch or record it. Yet someone sent me a text around midnight informing me that Kobe had 53 points at the end of three quarters. If Bryant had eventually scored 101 points, I suspect I would have received 18 texts, three phone calls, and a fax.3 Seven years ago, the Pistons and Pacers were involved in a brawl that spilled into the stands, ultimately resulting in 146 game suspensions (86 for Ron Artest alone). When the fight happened, I was in a tiny bar in Brooklyn with no TV, listening to “Buffalo Stance” at a semi-intimate birthday party. Twitter did not yet exist, and — even if it did — my 2004 phone didn’t have Internet access. Yet I knew everything about this fight long before I got home; late-arriving party guests told us what had transpired the moment they walked into the bar. It was the first thing they said, even before “Happy birthday.” It was like they had to tell us, even if they themselves did not particularly care. What I’ve come to accept (and this is both good and bad, but mostly bad) is that — for the rest of my life — I will never not instantaneously know about any marginally insane event. There’s just no way to avoid the information. The world is too mediated and interpersonal relationships are too connected. Because most adult relationships are now predominantly based around new technologies, it’s almost as if there’s a built-in responsibility to immediately distribute whatever interesting information we acquire. People constantly complain about Facebook, but that doesn’t mean it hasn’t changed them; they’re complaining because it has changed them. And they know it. They can feel it. There’s still a difference between somebody’s online profile and who they actually are, but that difference is decreasing and — in 10 years — will likely become negligible. Everyone has become a special-interest newspaper. Everyone wants to break news. If I record Thursday’s Mavs-Heat game and wait until Friday morning to watch it, will I be able to avoid discovering that Miami won in overtime? Probably. I could probably avoid hearing the score or knowing that it was an especially thrilling game. But could I avoid hearing that LeBron James scored 85 points? 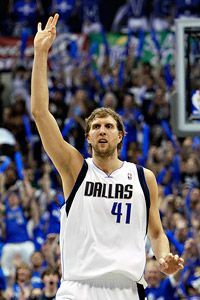 Could I avoid hearing that Dirk had 51 at halftime? Could I keep from learning that the roof of American Airlines Center tragically collapsed? What if Miami never missed a single field goal for the entire second half? What if Mark Cuban grabbed the PA microphone seconds before tip-off and publicly announced he was gay? What if a bear broke into the stadium and started attacking players on the court, forcing Shawn Marion to tackle the bear and break its neck? Is there any chance I could avoid hearing that news before pressing “play” on the DVR remote? No. No way. There’s no possible way I could avoid hearing about any of those situations. And — sure — those scenarios are preposterous and implausible. But so was the possibility of an earthquake happening during a World Series game. So was the likelihood of an NBA title game being interrupted by the LAPD slowly chasing a Hall of Fame tailback down the freeway to arrest him for double homicide. So was Monica Seles getting stabbed at the French Open in Germany, Reggie Miller scoring eight points in less than nine seconds, and the conclusion of the 1982 Cal-Stanford game. It’s difficult to project fictional scenarios that are more oblique and unexpected than the craziest moments from reality. We all understand this. And that understanding is at the core of the human attraction to liveness. We don’t crave live sporting events because we need immediacy; we crave them because they represent those (increasingly rare) circumstances in which the entire spectrum of possibility is in play. They’re the last scraps of mass society that are totally unfixed. When you watch an event in real time, anything is possible. Someone could die. Something that has never before happened could spontaneously happen twice. When there are three seconds on the clock, not one person in the world can precisely predict how those seconds will unspool. But if something happens within those three seconds that is authentically astonishing and truly transcendent — well, I’m sure I’ll find out about three minutes after it happens. I’m sure someone will tell me, possibly by accident. You can avoid the news, but you can’t avoid The News. Living in a cave isn’t enough. We’ve beaten the caves. The caves have Wi-Fi. And that, ultimately, is why a prerecorded game can never feel the same: If I don’t know anything about the event I’m about to watch, I can be certain that nothing except a good game is going to transpire. I know I’m merely going to see a slightly different version of something I’ve seen a thousand times before. And even though I think that’s all I want, it doesn’t come close to what I need. Or — in the case of Buffalo Bills wide receiver Steve Johnson — failing. I do not own a fax machine.